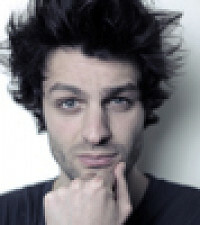 Antoine Tesquier Tedeschi’s mother always used to remind him to turn off the lights as he was growing up in Paris. After spending some time in Miami, Antoine settled in London and created Hu2 The Wall Sticker Laboratory to create fun, graphic reminders for the rest of us. He first began selling these high design and very functional stickers on the weekends at a market stall in London. Antoine’s focus is on creating designs that make information look beautiful. The “Hu” in his company’s name is a tip of the hat to the periodic table and a reference to the human factor of design. He has created a series of story-telling reminders and signage-related home stickers that decorate walls (and toilets!) beautifully. Hu2’s stickers are made in London by Antoine’s multi-award winning ethical business, and they can be applied to any smooth surface including walls, windows and furniture. They are as easy to remove as they are to apply, and leave no residue. They’re all PVC-free, printed with vegetable ink, and packaged with materials approved by the Forest Stewardship Council. Hello Everyone! I’m Antoine the founder of Hu2 Design. I am so glad to see my Eco Reminders wall decals featured on Daily Grommet today. 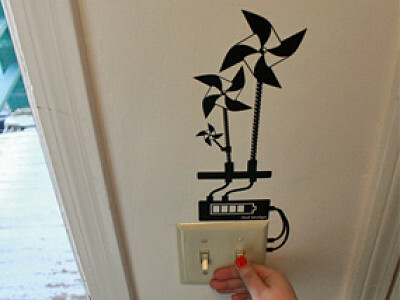 These light switch stickers have been designed to remind you to switch off your lights and save energy. We are all aware about the energy issues we are facing nowadays. So let’s save the planet, and save your money! I would be delighted to answer all the questions you may have about Hu2 and our products. Drop me a line! I love the whimsy of these! *post deleted by admin. We don't take down posts when they are critical of our offering but we do take down posts when they are disrespectful. What is the toliet bowl sticker suposed to remind me? Does it destroy the world to flush my toliet after i use it? @pinkytoes: Hu2 actually has a wide array of stickers some with eco messages and some that are more on the quirky side and are just for fun. @RobinLee: That toilet monster IS cute! 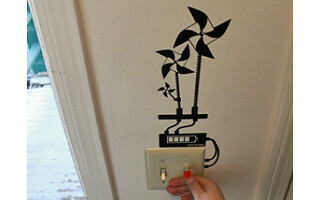 These are amazingly clever, decorative and get the needed ecological message across. As an interior designer I think they would be a hit in any home. Thank you to the creator and to Grommet for featuring them. Those stickers are sick ! need one ASAP ! We are fans from the first hour, and are happy to teach our babies, along with the nice and fun Antoine's design, to take care of our planet. Antoine Tesquier Tedeschi’s mother always used to remind him to turn off the lights as he was growing up in Paris. After spending some time in Miami, Antoine settled in London and created Hu2 The Wall Sticker Laboratory to create fun, graphic reminders for the rest of us. He first began selling these high design and very functional stickers on the weekends at a market stall in London. Antoine’s focus is on creating designs that make information look beautiful. The “Hu” in his company’s name is a tip of the hat to the periodic table and a reference to the human factor of design. He has created a series of story-telling reminders and signage-related home stickers that decorate walls (and toilets!) beautifully.